Known originally as The Casa Romero Compound, this historic oasis with mature landscaping sits just off the main plaza in the center of town. 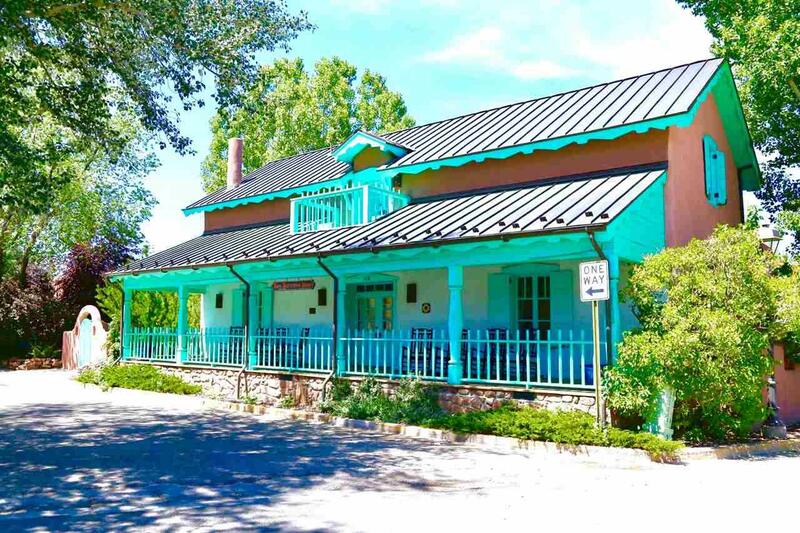 The main house was originally constructed in 1875 with 18" adobe bricks, hand blown beveled windows with wood shutters, wood floors, elaborate carved wooden doors, vigas and latillas in the ceilings, four kiva fireplaces, projecting balconies and gabled roofing. A classic Center Passage Territorial, the home includes a main sala, perfect for entertaining and 4 generous equally proportioned rooms on the ground level. Two luxurious master suites occupy the second floor as well as two balcony areas. 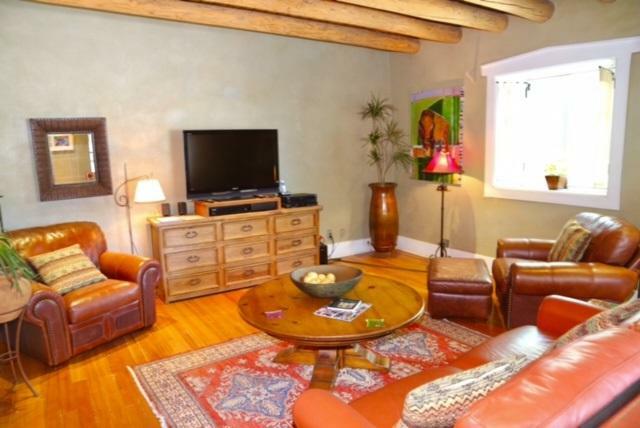 Also included are two colorful stand alone, 1BD/1BA casitas, fully furnished and hand painted by Taos' own Jim Wagner. A 1,200-sf artist studio building known as the Chicken Coop, was redesigned as a sophisticated loft/guesthouse apartment with 2 baths, galley kitchen, large windows, stone floors and oversized ceilings. Each of the buildings/units enjoy private seating areas, gardens and hot tubs. The entire estate was lovingly restored in the early 2000's to add new kitchens, new bathrooms, new windows, inlaid wood floors, and soft plaster walls. Intricate details such as Greek Revival trim around the windows, squared columns with chamfered corners which adorn the front porch, and a Cooper pitched raised seam roof on the main house. The compound offers the perfect blend of modern upgrades and historic charm with meticulous landscaping. 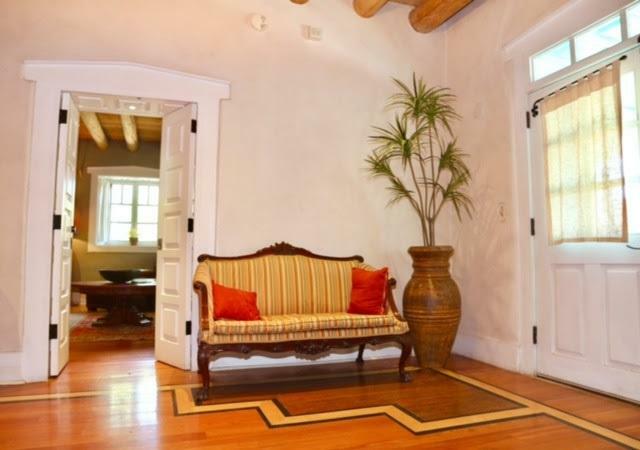 The property is perfect for a family retreat, private school or museum, or investment vacation rental property. Spend quiet evenings sitting on the front porch, take short walks to summer concerts on the plaza, the weekly organic farmers market, or one of many excellent restaurants in the area. Host an elegant dinner party in the large dining room, or dine alfresco under one of several portals. Located on the corner of a narrow quiet street, this home is perfect for those who appreciate the custom touches and character that only vintage homes can offer. There is also a basement for storage in the main house and a large parking area/driveway that adds easy access and secluded charm. 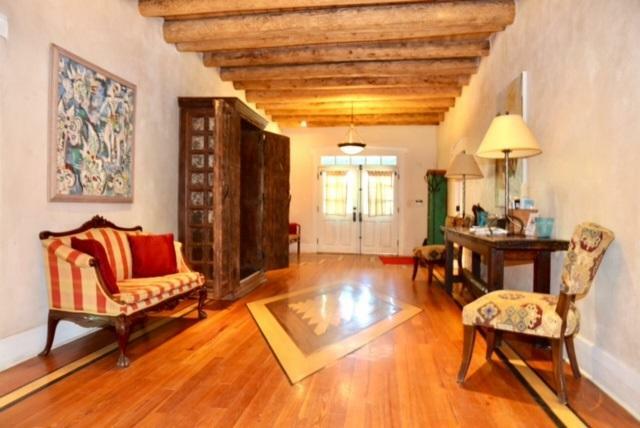 Call us to see this exquisite landmarked estate in the heart of the historic district.